JAAS members are invited to submit proposals for papers to be included in the 31th issue (June 2020) of the Japanese Journal of American Studies. Papers on any topic within the field of American Studies, including those related to this issue's special topic, "community," are welcome. JAAS members are invited to submit proposals for papers to be included in the 30th issue (June 2019) of the Japanese Journal of American Studies. Papers on any topic within the field of American Studies, including those related to this issue's special topic, "Democracy," are welcome. Submission forms for Independent Paper presentations, Symposiums, Panels, and Workshops at JAAS 48th Annual Meetings in June 2014 are as follows. Submission forms for presenters in Independet Paper Presentations, Symposiums, Panels, and Workshops at JAAS 47th Annual Meeting in June 2013. The Japanese Association for American Studies is the largest academic association for Americanists in Japan and aims to promote American studies in Japan through publication and activities facilitating communication and cooperation among specialists on the Americas. The origin of the Association can be traced back to September 27, 1947. The number of original members was about 200. As it has enjoyed a steadily growing popularity, the Association boasts 1,146 members as of April 2000. The disciplines and interests of members include history, literature, political science, economics, international relations, Japan-U.S. relations, law, religion, education, sociology, philosophy, women's studies, ethnic studies, art history, cultural studies, and others. This variety in disciplines and interests is a great asset for cultivating a dynamic, multifaceted understanding of American cultures and societies. 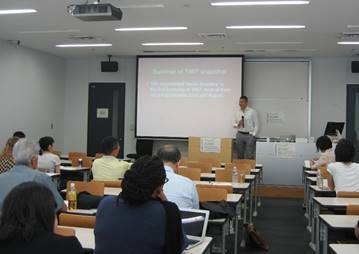 JAAS aims to promote American studies in Japan through publication and activities facilitating communication and cooperation among specialists on America. An individual or an institution with an interest in American studies, sympathetic to the aim of the Association and willing to cooperate in its activities can apply for membership. An individual member is required to have an M.A. or Ph.D., or to have scholarly publications and/or be engaged in professional activities equivalent to having an M.A. degree. 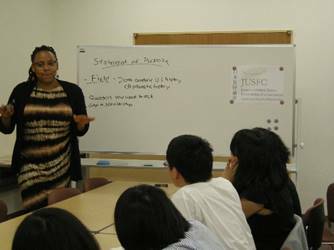 The disciplines and interests of members include history, literature, political science, economics, international relations, Japan-U.S. relations, law, religion, education, sociology, philosophy, women's studies, mass culture, ethnic studies, and others. This variety in disciplines and interests is a great asset for cultivating a dynamic, multifaceted understanding of the United States.